Striking design features include the long wheel base for the vehicle length, short overhangs and removable center panel from fiberglass as well as the wide safety bar. the 914 featured pop up lights. Today the 914 Porsche roadster remains the most affordable path to a classic porsche ownership outside the 924/944. they offer serious potential for fun with the right mods and the right attitude in place. 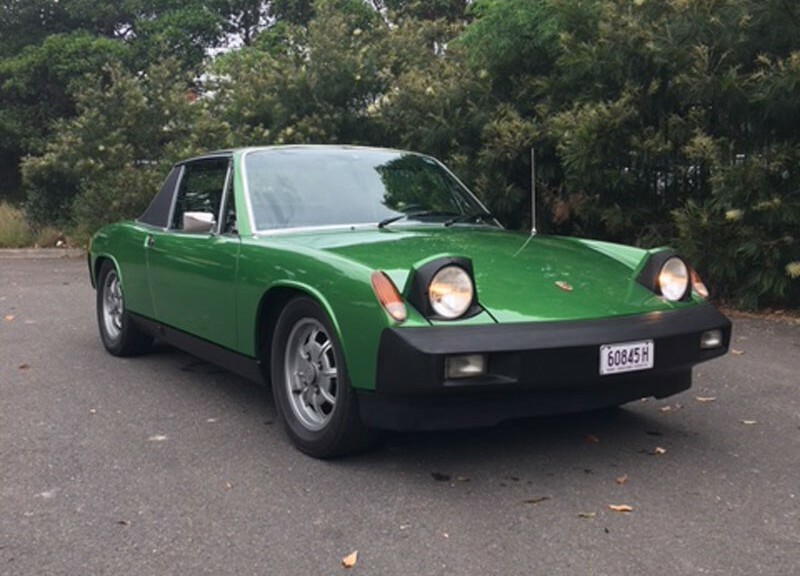 The 914 on offer is a 1975 Model built in December 1974, LHD in striking Palma Green metallic paint that was repainted some 20 years ago, black basket weave vinyl interior. Largely original with Becker radio. Factory options “L” package include vinyl cover on B pillars, driving lights, dual horns, center console with additional equipment. Weber carburetors. good service history.